Prologue: President Benigno Aquino III himself was the special guest during the 5th Regular Congress of Akbayan. In his speech, he called Etta Rosales his “favorite”, hinted that Risa Hontiveros will soon be senator, and declared that even before he became president, “iisa na ang takbo ng utak namin ng mga myembro ng Akbayan.” The chumminess of the country’s most powerful man with Akbayan was in full display, with Aquino jesting that Ronald Llamas is no longer a sosyalista, but has become a sosyal. But Akbayan is not laughing now as it struggles to answer its critics – can a party-list of presidential favorites and sosyals, a party-list of people who think like Malacañang – still claim to represent the under-represented and marginalized? The Commission on Elections (Comelec) is in the middle of cleansing the party-list system, a long overdue initiative. So far, it has already disqualified 16 party-list groups, including four incumbent parties which have a combined seven representatives in the current Congress. But it seems that the first true test of the poll body’s integrity and independence is the case of Akbayan. From the usual suspects like Mikey Arroyo’s Ang Galing Pinoy (already delisted by the Comelec), Ako Bicol (among the disqualified parties) and others, public attention has now shifted to the contentious case of Akbayan, which the Kilusang Mayo Uno (KMU) and several youth groups led by Anakbayan asked Comelec to disqualify because they are already “well-entrenched in government”. Akbayan stalwarts in the Aquino administration include controversial presidential adviser Ronald Llamas, Commission on Human Rights (CHR) chair Etta Rosales, and National Anti-Poverty Commission (NAPC) chief Joel Rocamora, among others. Running under the administration senatorial slate in the 2013 midterm polls is Risa Hontiveros. Aside from Akbayan, election watchdog Kontra-Daya also said that other groups associated with Malacanañg like the Black and White Movement of Budget chief Butch Abad, Presidential spokesman Edwin Lacierda, Social Welfare Sec. Dinky Soliman, and peace adviser Ging Deles, among others should refrain from participating in the party-list system that is exclusive to the under-represented and marginalized. Despite Akbayan Rep. Walden Bello’s attempt to divert the issue by again red-baiting, the legitimacy of the question being raised by Anakbayan and others continues to gain traction. In fact, even long-time poll watchdog Parish Pastoral Council for Responsible Voting (PPCRV) has joined calls to disqualify Akbayan and Black and White Movement. “Hindi naman sila marginalized. Marginalized ba sila eh may posisyon ang mga lider nila sa pamahalaan? Nandun na sila sa kalapit-lapit na power tapos sasabihin mong marginalized ka at unrepresented ka? Unrepresented voice of the marginalized? Kahit hindi naman marunong mag-isip, kaagad-agad ay makikita yun,” its chairperson Henrieta de Villa said. Indeed, Comelec chairman Sixto Brillantes and the rest of the poll body are confronted with the challenge of showing impartiality in their review of the qualification of party-list groups that have close ties to Malacañang. A particular official who will be closely monitored is newly-appointed Grace Padaca, a former Liberal Party (LP) member. Will she inhibit from the deliberations to help make the process credible? The ball is now in Comelec’s court. With its first two rulings, the general view is that the Comelec has been moving in the right direction in its campaign to weed out sham party-list groups. Strictly applying the condition of representing the under-represented and marginalized, it barred undeserving party-list groups from running in next year’s polls. Will the Comelec apply the same strictness on Akbayan and Black and White? The case of Akbayan is a curious one because not too many elections ago, it was raising the same issue it is facing now against other party-list groups. In 2007, Akbayan campaigned to disqualify party-list groups that were supported by the then Arroyo administration. Then Akbayan Rep. Rosales said that the Comelec’s accreditation of groups backed by Mrs. Gloria Arroyo made a mockery of the Party-List System Act. Citing the Supreme Court (SC), then Akbayan chair Rocamora reminded the public that groups that are an adjunct of or assisted by the government are disallowed to run in the party-list elections. Government interference undermines and weakens the party-list system, Rocamora added. A lot has changed in five years. By virtue of their close ties with President Benigno Aquino III and his LP, Akbayan has been able to put its people in high-ranking government positions. Aside from Rosales, Rocamora and Llmas, other Akbayan officials appointed by Aquino in various executive posts are Mario Aguja (member of the board of trustees of the Government Service Insurance System or GSIS), Percival Cendaña (National Youth Commission’s commissioner-at-large), Ibarra Gutierrez (undersecretary for political affairs) and Angelina Ludovice-Katoh (member of the Presidential Commission for the Urban Poor or PCUP). Now in power, Akbayan is singing a different tune. They are claiming that their close ties with Malacañang do not automatically make Akbayan a Palace-backed party-list group. The main difference with the Arroyo administration and its party-list groups, according to Akbayan, is that they were not created by Aquino and were in fact a pioneer in the party-list system. They also supposedly do not receive funds from Malacañang. In fact, Akbayan is not only Palace-backed but is in effect an extension of Malacañang. Think of it this way – Akbayan, through its former president provides political guidance to the most powerful man in the country. The special position that Akbayan holds in the Aquino regime is underscored not only by numerous appointments but how the President has firmly stood by its officials like Llamas who got embroiled in the pirated DVD and AK47 controversies. By any stretch of imagination, Akbayan could not claim under-representation when it is a key part of the powers that be. It is also grossly unfair to the truly marginalized parties competing in the party-list elections that Akbayan as well as Black and White have direct access to the huge resources of the executive branch. While they are not directly funded by Malacañang, they have access to billions of pesos in CCT (conditional cash transfer) funds that could be used for political patronage and electioneering. 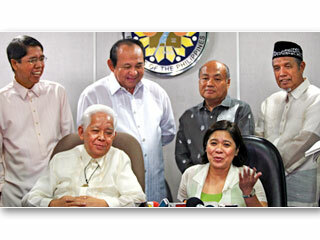 Poll body split but Brillantes for Akbayan, Padaca as tie breaker? Brillantes has earlier disclosed that the poll body is split on the issue of whether or not Akbayan and Black and White should be allowed to run in the party-list elections. “Nakabitin yan. May debate,”the Comelec chief said. But it seems that if Brillantes can have his way, he will accredit Akbayan and Black and White. In a separate interview, he pointed out that a party-list group could not be faulted for having officials in the executive branch. “At least ang position ko is that overrepresented in Congress ang aking interpretation. If you are overrepresented in government, it’s not really a bar for you to participate,” Brillantes was quoted as saying. The good news for Akbayan and Black and White is Grace Padaca the newly appointed seventh poll commissioner who is expected to break the impasse in the Comelec. While Padaca’s selection was already controversial because of her ties with the LP, her neutrality as an election official has also further become suspect with how Malacañang went all-out to ensure her appointment in the poll body. And if the Comelec decides to pass the test on its integrity and independence and go against the will of the Palace, Akbayan and Black and White could still take comfort in the fact that the SC under Chief Justice Ma. Lourdes Sereno could take up the cudgels for them. Just recently, Sereno used her TRO power (temporary restraining order) to stop the Comelec from unseating an LP member as town mayor. Indeed, power has its many perks.